Hilarity and magic on Martha's birthday in the third book in this young series by Carnegie and Branford Boase long-listed author Joanne OwenIt's Martha's birthday and the village has planned a surprise party for her - but grumpy witch Griselda Gritch ruins the surprise! 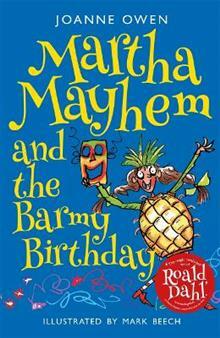 Hilarity and magic on Martha's birthday in the third book in this young series by Carnegie and Branford Boase long-listed author Joanne OwenIt's Martha's birthday and the village has planned a surprise party for her - but grumpy witch Griselda Gritch ruins the surprise! Not to worry - Martha's biggest birthday wish comes true when her mum and dad return from their tropical trip especially for her party. Everyone is delighted (apart from grumpy Griselda) and excited to have fun with Martha's present: The Mysterious Mask of Truth, brought back from her parents' far-flung travels. Fun, that is, until the truth starts causing everyone quite a lot of embarrassment . . .